The new interactive climate change wall in the Hall of Planet Earth at the American Museum of Natural History. 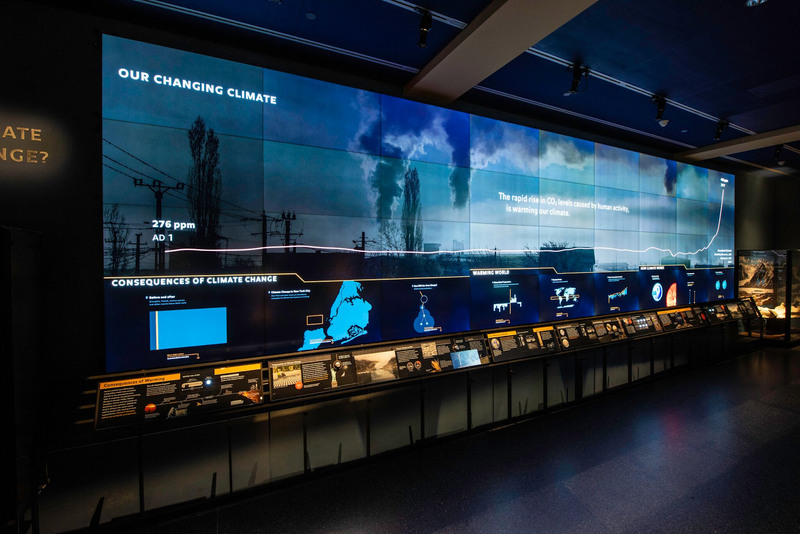 A new interactive climate change exhibit will open at the American Museum of Natural History (AMNH) this week, becoming the museum’s first permanent installation dedicated to modern day, human-caused climate change. It’s replacing a climate-centric portion of the museum’s Hall of Planet Earth, which features a ton of good rocks and a pretty awesome piece of petrified wood, but is 20 years out of date. Museums are an essential arm of science communication, especially considering their reach (over five million people visited AMNH in 2017). This role comes with the huge responsibility of educating the public on the most important science news, and helping people suss through what’s fact versus BS peddled by special interests. While AMNH has included bits and pieces about climate change in its other exhibits (and had a temporary exhibition on the topic from 2008-2009), it’s playing catch-up with institutions like San Francisco’s California Academy of Sciences—particularly on the climate action front. The new installation includes of a complete renovation of the paleoclimate section of the Hall of Planet Earth, which show how scientists are using everything from corals to ice cores to understand what our planet looked like in the past, and what it may look like in the future. The crown jewel, however, is a feature wall composed of 36 55-inch HD screens. It serves as the centerpiece and overview of the experience, featuring a set of gorgeous Earth images and visualizations depicting our changing climate. The size of the screen dwarves visitors, putting information on how Earth’s climate works and how climate change is impacting our world into stark perspective. The entire thing is visually stunning; it almost feels like the exhibition is there to debut these new technologies within the museum rather than the content itself. That said, the new technology allows the exhibit’s curators to update any of the information that’s displayed as new science becomes available. For instance, much of the imagery on display comes from 2017’s disastrous hurricane season: image sliders depict the British Virgin Islands before and after Hurricane Irma tore through late last summer; a satellite image showing Harvey, Irma, and Jose in various states of formation is one of the many cycling on the large screen. This year’s hurricane season will offer another data point that could be included in future image sets. Visitors interact with the before and after slider feature. The place where this is most useful in the exhibit is in the “Warming World” section. It features three data visualizations, all depicting changes in Earth’s temperature on different spatial and temporal scales. As time passes and scientists record new climate data, it has the potential to be incorporated into the visualizations. The most compelling part of the exhibit for me was the interactive showing how climate change creates a cascade of threats. For instance, the exhibit discusses how a climate impact like drought can lead to famine, which can contribute to armed conflict. Rising temperatures of course impact us all, but these cascade effects often feel more urgent and dire. To that end, it surprised me that the exhibit didn’t include anything about taking action against climate change. Of course, AMNH correctly points the blame at man-made greenhouse gas emissions. But beyond a mention of a community in New York City is whitewashing its roofs in the “How Climate Change is Impacting Us Locally” section, there was nothing in the exhibit about how people can and should work to reign in global warming. AMNH has recently come under scrutiny for having concerning connections to the fossil fuel industry and featuring prominent climate change deniers, such as David Koch, on its board of trustees. Although Koch has been gone from the board as of 2016, the negative attention has recently shifted to Rebekah Mercer, whose family’s connections to Breitbart, the Trump Foundation, and the Heartland Foundation cannot be ignored. To AMNH’s credit, these funding conflicts are in no way as apparent as they are in the Koch-funded “Hall of Human Origins” at the National Museum of Natural History in Washington, D.C. Still, for an incredibly modern exhibit that includes such up-to-date data and images, it’s unfortunate that the AMNH’s modernity doesn’t extend to the inclusion of solutions in its climate exhibit. When reached for comment, the Museum sent a statement affirming its commitment to providing the public with “evidence-based, scientific information about the most important scientific issues of the day,” such as climate change. The statement went on to explain that the Hall of Planet Earth “is just one way that [AMNH] advances the popular understanding of climate change and its effects,” and directed Earther to its long list of climate education resources. The new AMNH exhibit may choose to focus on the science, but we don’t have the luxury of abstaining from getting political about climate change—it’s always been a political issue, even before Scott Pruitt graced the EPA with his presence. Although there’s an argument to be made that a permanent exhibit in a museum shouldn’t feature newsy information that could quickly change (such as the beliefs and behavior of our elected officials), above all else, a museum’s role is to educate the public. Discussing the realities of our world—messy human politics and all—doesn’t reduce a museum’s credibility. It shows the institution is dedicated to spreading truth, no matter where that truth comes from. We’ve reached out to the AMNH for comment on why it chose not to include more information on policy and solutions in its new climate installation and will update this post when we hear back. The new exhibit opens to the public on Saturday July 7. Admission is included in the price of a normal ticket. Disclosure: The author was a research intern at AMNH’s Sackler Institute for Comparative Genomics for four summers between 2012 and 2017.